The horse has loomed large in China’s long and storied past. It’s not surprising then, that several pop up in the works of the master of modern Chinese painting, Shi Lu (1919-1982), in an exhibition soon to open at Te Papa, Shi Lu: A revolution in paint. Shi Lu, Horses drinking at Yan River – draft 4 1960, ink and mineral pigments, National Museum of China, gift of Shi Lu’s family, 2012. Since its domestication in pre-historic times, the horse has played a crucial role in China’s history. Mounted cavalry proved decisive in battles, especially with the expansion of China during the Yuan dynasty (1206-1368). The companion exhibition to Shi Lu, Throne of Emperors, explores this imperial history through the lives of seven figures that left their mark on China and the world. Fast-forward two millennia and the forces under Mao Zedong were still reliant on horses during battle. Horses drinking at Yan River is one of several drafts for a large-scale history painting that depicts the communist revolutionary base at Yan’an. The painting itself did not survive the Cultural Revolution (1966-1976). 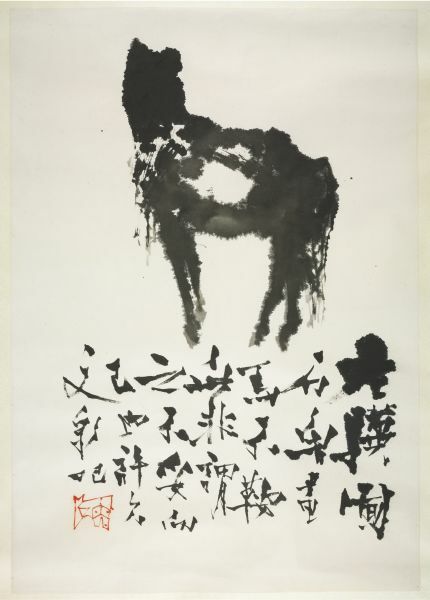 Shi Lu, An old horse, 1973, ink on Chinese paper, National Museum of China, gift of Shi Lu’s family, 2012. Shi Lu’s reserves were also tested during this period as he was persecuted and imprisoned during the Cultural Revolution. As an artist whose life spanned the cultural and political turmoil of the twentieth century, Shi Lu was constantly balancing the often contradictory expectations of aesthetics and politics. He worked in a traditional mode of Chinese painting, but was committed to making this relevant to the modern age. He wrote of his ambition ‘one of my hands stretches into tradition, the other into life’. By the 1970s, he wore his scars openly. The inscription on this work translates as: ‘Although the old horse no longer has a beautiful coat, the ambition is still there.’ This references a well-known Chinese proverb: ‘An old war horse in the stable still longs to gallop a thousand miles.’ Shi Lu’s identification with the subject of the painting is reinforced by his seal, which echoes the form of the old horse. According to the Chinese lunar calendar, 2014 is the year of the wood horse. It has been said that the combination of wood and horse makes it a year when people will ‘stick to their principles and stand firm’. [i] This seems a fitting year to be hosting this exhibition, which introduces Australasia to Shi Lu, an artist whose fortitude in the face of adversity was remarkable and which speaks of his commitment to life, and to art.